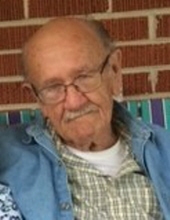 Edward Lee Chumley, age 83 of Jasper, GA went home to be with the Lord Sunday, January 13, 2019 at Murray Medical Center in Chatsworth, GA. Edward was born June 12, 1935 in Ball Ground, GA to the late Dewey and Nellie Chumley. He served his Country proudly in the United States Navy during the Korean War. Edward loved Bluegrass music, singing and playing his guitar. He also loved to attend Mt. Zion Baptist Church and events at Pickens Co. Senior Center. children, Debra Clymens, of CA., Angela Mahler, of N.Y., Rosa Leta Torres, of N.Y.; step-children, Larry and Kathy Beck, of Jasper, Mike Beck, of Jasper, Kathy Beck, of FL, Guy Burgess, of Ellijay; grandchildren, Seth Lambertson, Shawn Lambertson, Donald Leonard, Kristi Leonard, Adam Leonard, Ryan Lamb; numerous great-grandchildren and friends also survive. Graveside Services will be held Tuesday, January 15, 2019 at Liberty Grove Baptist Church Cemetery with Rev. Ben Mock officiating. To send flowers or a remembrance gift to the family of Edward Lee Chumley, please visit our Tribute Store. "Email Address" would like to share the life celebration of Edward Lee Chumley. Click on the "link" to go to share a favorite memory or leave a condolence message for the family.